Happy New Year, Friends!! I honestly cannot put into words how excited I am for the arrival of 2016 and to see 2015 end. I don't really buy into the whole "new year, new me" thing, as I believe bettering one's self and goal making (and achieving!) should be an ongoing process, but this time I do welcome the idea of a fresh start as I replace the old calendar with a new one. Now, with the holidays over and as my family and I try to re-establish our usual routine (which is always so hard to do after a long holiday like Christmas and New Years), I've been reflecting back on my year. I tried to think about all the good things that had happened, as few and far between as they were. Admittedly, it was a bit of a struggle. I had started 2015 with a bout of tendonitis that evolved into Carpal Tunnel Syndrome which resulted in me not being able to knit for the first three to four months. My goals of concentrating on sweater knitting immediately went down the drain. As did my mental health, since knitting was not only my stress reliever but also my sanity saver. My overall health was crap too. It took half the year to find out that I was suffering from chronic sinus infections from my so-called "seasonal" allergies, and that all the other health ailments I was dealing with were actually symptoms and side effects of these infections! At least I learned a few things from all this: one, I'm not dying from a much greater, life threatening illness; and two, self-diagnosing via Google is never a good idea. Ever. Not even for something as simple as a sore throat. To keep my mind off the fact that I couldn't knit (or sew) I decided to concentrate on my running. I don't consider myself a runner, I don't like to tell people that I run, and I rarely, if ever, broadcast about my running on social media (except for Twitter...but that's because I don't think anyone actually reads my tweets). So it came as a bit of a surprise to a lot of people (family included) when I proudly mentioned that I had ran and completed my first ever 8k road race back in October. Even signing up for the race was a huge deal to me, as I like to run solo and the idea of sharing the road with a couple hundred other people really didn't appeal to me. In the end the event wasn't as bad as I thought it would be - my time was much better than I had anticipated, having people around me motivated me to keep running, and although it took me a while to get comfortable running in limited space I found my groove and was pleasantly surprised to run most of the race in a nice, even pace. ♥ 18 items were knit from stashed yarns!! I'm so incredibly proud of this feat!! ♥ 1 Knit Picks order was made. For the entire year. ♥ 80% of the yarn I purchased in-person was from my LYS. Yay for supporting local!! Not bad, right? Now that I'm seeing it all written out, I'm actually feeling pretty darn good about what I've managed to accomplished knitting wise, despite the rocky start. Way to go me!! How did 2015 make out for you? For the past week I've been thinking about what goals I'd like to set for the new year. One of them is to definitely continue on with knitting from stash as much as possible. It's been great to finally bust out the yarns I've been hoarding and to actually knit with them! I'm going to ponder some more about what I would like to see happen and/or to accomplish this year, in the meantime, I think I'll go knit for a bit. Cause my hands feel good! Yay!! I just recently starting following your blog (signed up yesterday) but have been reading some back pages for about 2 weeks. I am glad you can finish the year on such a positive note. I too hope that 2016 will be a better year. Hi Sheree! Welcome and thanks for reading! :) And thanks for sharing the link, I've never heard of swing needles before! I like the concept of them and will have to experiment with the idea. Happy 2016 to you! 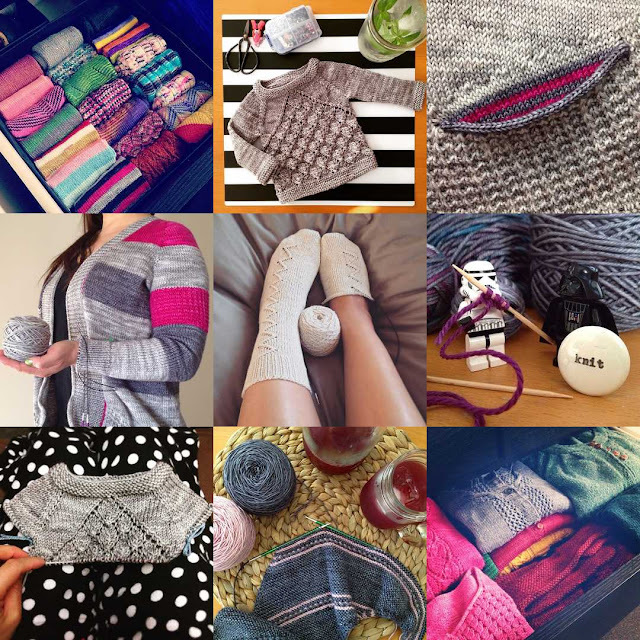 I'm so impressed with your productivity (and excellent record keeping) for 2015, you knit so many beautiful things! Here's to another great year of stashbusting and beautiful knits. These are fantastic stats. I appreciate the breakdown and how you did the yards conversions. I'm glad to read your hands are doing better and you're not currently suffering from a sinus infection. I get that once in a while. I get sinus headaches more. Thanks Stefanie! I have to remind myself to balance out the knitting with non-knitting days - as much as I would like to NOT have non-knitting days. I'm hoping these days will force me to do the other things that come with knitting...like weaving in ends, sewing on buttons, and putting away the needles I've used for past projects instead of sticking them all into a yarn cake on the desk (not that I know that fro experience...ahem...).